Listen to "The Real Book of Real Estate" on your iOS and Android device. In a world where too many financial advisors do not follow their own advice, here is a book written by experts who practice what they preach and who will teach you how to thrive, not merely survive, during turbulent economic times. This is the real deal...The Real Book of Real Estate. The only thing better than one real estate expert teaching you how to invest and win is twenty-two real estate experts with that same mission. 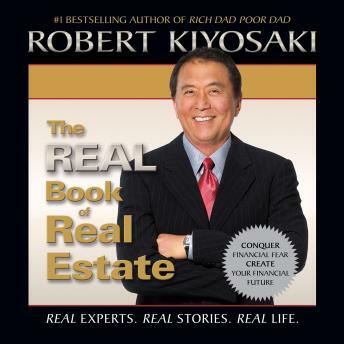 Robert Kiyosaki, bestselling author of Rich Dad Poor Dad, has assembled an unrivaled cast of real estate wizards and trusted advisors with one purpose in mind: to share their knowledge and teach you to win in real estate. The Real Book of Real Estate will be your number one source as you decide the real estate niche that is perfect for you; as you navigate the ups, downs, and in betweens of the real estate market; and as you become the expert you know you can be. The worst book of Kiyosaki ever. It seems RK is just trying to use inersion from "the rich dad & poor dad". Not a RK fan any more. I thought RK could find a better ways of making money! Book is good and a great starter for anyone looking to understand the real estate market and investing.